Very powerful Medium Fast Spey Rod - real Cannon! The Skagit Max is an exceptionally easy casting Skagit style shooting head that will cast big flies, and the heaviest sinking tips with the utmost of ease. A unique taper design not only casts all the nasty stuff associated with Skagit fishing, but also forms beautiful loops and is extremely pleasant to cast. 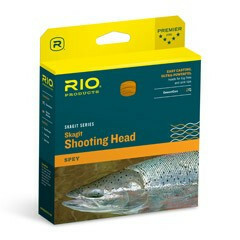 The head is built on RIO's ultra-low stretch ConnectCore for the utmost in casting control and sensitivity, and has a highly visible orange section loop for easy recognition. 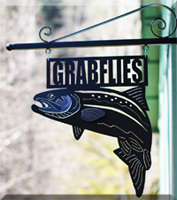 It is available in a multitude of lengths and weights to cover all rod and angling situations. 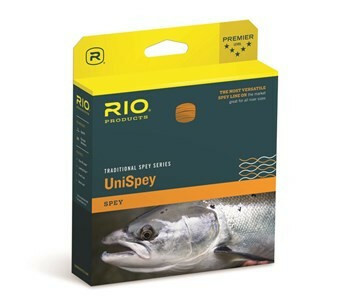 RIO’s UniSpey has a powerful mid length head that is the most versatile of spey line designs, and that will cast long distances with ease. 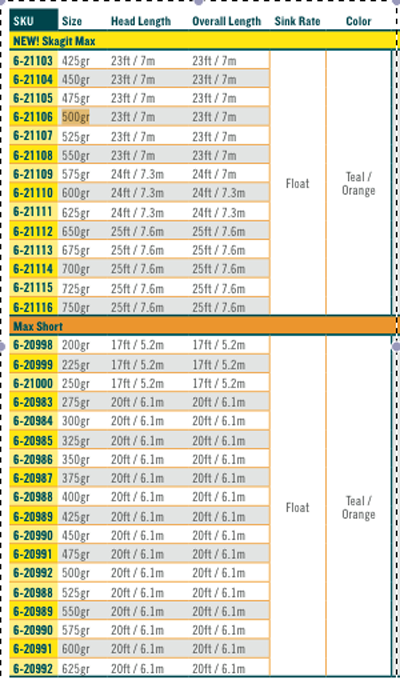 The head length is ideal for Spey rods between 12ft and 14ft in length, and for mid-sized rivers. Anglers will find the line loads best when the black “loading point” is between the reel and the rod tip. Welded loops in the front make it very easy to rig.